Wave 2! Woo hoo! 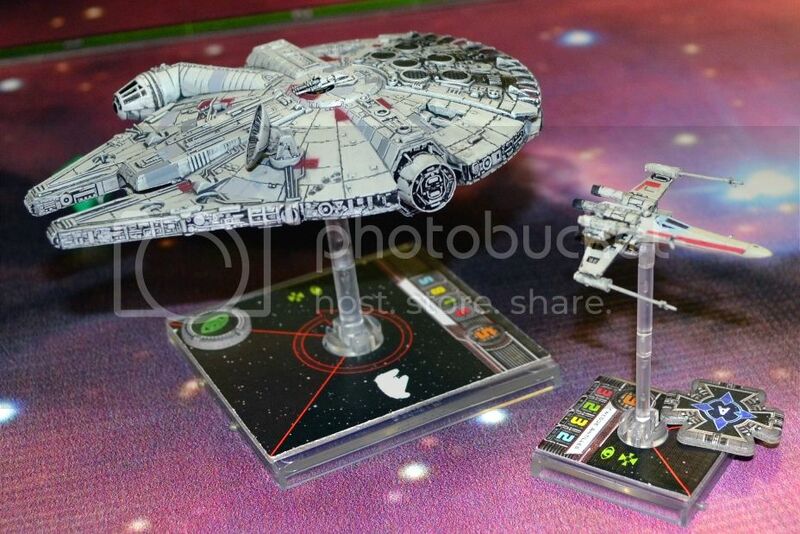 A-Wings, TIE Interceptors, Slave-I, and the freaking Millennium Falcon! I still haven’t picked up quite everything yet, but I have enough to put together a few squads, and was thrilled when Chris K wanted to play an Imperial squad he had come up with. So, my Rebel list consisted of the Millennium Falcon being piloted by Chewie and with Luke on the guns, and it was loaded up with Assault Missiles and a Weapons Engineer. His wingman was Wedge Antilles with a Shield Upgrade, R2-D2, and a Proton Torpedo. The way I had it envisioned was that Wedge would do most of the damage, so in order to protect him even more, Chewie took the Draw Their Fire elite upgrade. 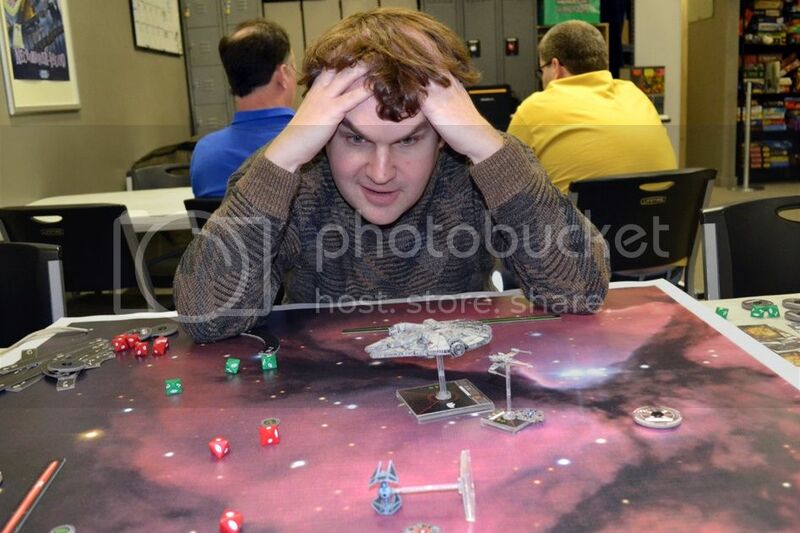 Chris was playing a semi-swarm squadron with 2 TIE Interceptors and 3 TIE fighters. And since we were both trying out new ships, we decided to just go with a wide-open board and no real scenario other than to blow each other up. 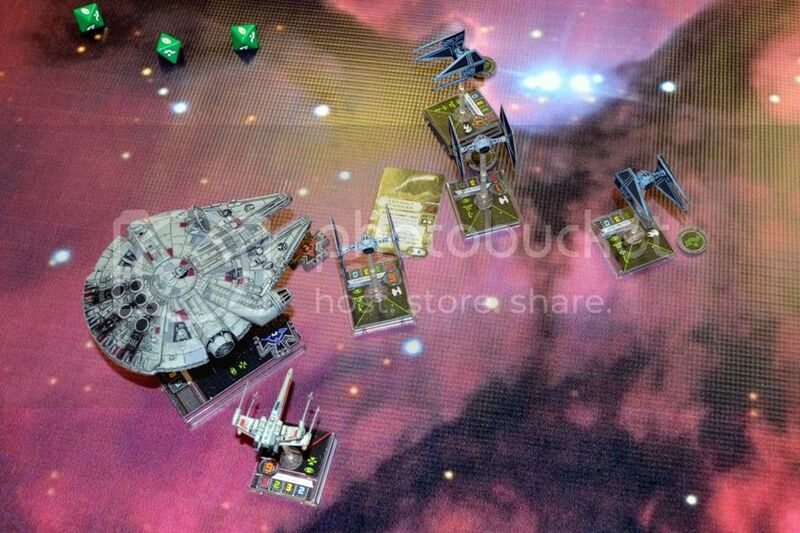 I started off by easing my way out into the table while Chris ran his ships forward at high speed. When we engaged, I had a really good turn. Wedge got a significant hit on Backstabber doing 2 hits to him, and then Chewie used his Assault Missiles against another TIE fighter that was within range 1 of both Backstabber and a couple of other ships. The missile only did 1 damage to the primary TIE, but the extra 1 damage that splashed out to the other ones was enough to eliminate Backstabber before he even got off a shot. A few turns later, Chris got in a nearly-devastating hit on Wedge. Even with the Shield Upgrade, a couple of TIEs took out his shields and smacked him with a critical hit. It wasn’t too bad, though (prevented him from taking actions until he rolled a hit on an attack die), and after 3 turns of taking green maneuvers, his shields were back at full (thanks to R2) and he was tearing up TIEs again. In the end, I swept the table with the Falcon at just moderate damage (only 2 or so hull hits), so it was a good game for me! I’ve heard some disparaging thoughts about R2-D2 lately on the FFG forums, but on a ship that you really want to stick around (like Wedge) and especially with the Shield Upgrade, it seemed really nice to me. But for the next Millennium Falcon list I want to try, I’m definitely going more for using it as the big weapon (with Han as the pilot) and bringing Chewie along as a co-pilot (to get a little bit of his protective ability). 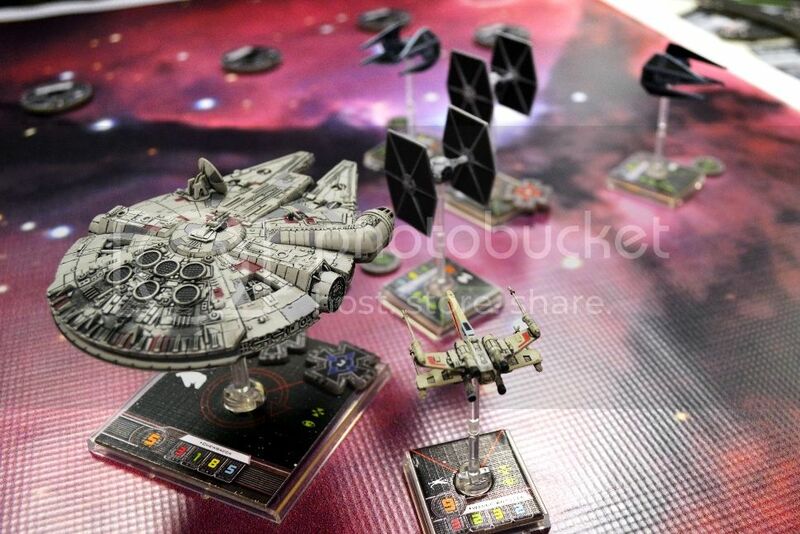 And while the Falcon is drawing everyone’s attention by lumbering up the middle of the board, I figured it would be nice to try out some A-Wings to flit around on the edge and still have the mobility to concentrate fire with the Falcon when needed. So we’ll see how that (or one of the other squadrons I’ve designed) works out next week. Next, I introduced Keith and Kenny to my new favorite race game, Salmon Run. For the first game, I started us off with a short ‘n easy board, which I won but wasn’t very interesting. But then, we put together a longer river (4 sections between the start and finish) that was much harder. It was so hard, in fact, that we totally ran out of Fatigue cards well before the end of the game. On one particular turn, I had just made a jump over a section of waterfall (which gave me a Fatigue, of course) when Kenny played a Current card that forced me to slide back down the waterfall space (which was marked with a Fatigue icon, giving me another Fatigue card) and which also happened to have a Bear standing on it (giving me, you guessed it, another Fatigue card), and then into the river space on the other side, leaving me with the necessity of once again jumping over the waterfall (giving me yet another Fatigue card) in order to continue my race. My disasterous slide back down the waterfall through a freaking bear! Kenny managed to get through the double-tier of waterfalls with relative ease while Keith and I struggled to make any progress at all. For a while, it looked like he was going to run away with it, but then he ran into some problems while we finally got over or around the rapids. Kenny still won, but it was a lot closer than we figured it would be. I just reviewed Salmon Run on my last podcast, of course, so there’s not much more to say about it right now. We actually got a little something wrong in this play, though. Part of the reason we ran out of Fatigue (in addition to the crazy-hard run of waterfalls) is that I mis-remembered the fact that you don’t have to play 3 cards on your turn, which gives you more room to not take on more fatigue (by not playing 3 swim cards) and to get rid of it easier (by playing just the fatigue cards in your hand, even if it’s just 1 or 2 of them). If there’s any real negative that I’ve seen with Salmon, it’s that the rulebook could be a little clearer and easier to reference. It sort of has that Fantasy Flight problem of having huge blocks of text that teach pretty well but are hard to pick through when you need to find something in particular. But still, it’s a really great game. I also just talked about Suspense: The Card Game on the podcast, and I talked in detail about it a few weeks ago, so I also won’t go into too much detail here. But basically, to finish out the night, we pulled out the prototype copy of it that I made a month or two ago and played through a session. Keith was new to Suspense/Xenophobe, so it was good to see a new perspective. We played using the rules and theme that Kenny and I consider to be the best, and it went pretty well. Kenny was in a position where he couldn’t be beaten just a couple of turns before he officially scored enough points to win, but I really don’t see that as a problem (as long as the rules explicitly said to declare a winner if they can show they can’t be beaten. And still, for what it is (a micro game of light deduction and bluffing with just 13 cards), I think it’s pretty incredible. Now I just need to convince Daniel (the designer) that our opinions on the rules and theme are correct! Chris, I hope you’ll revisit your review of Salmon Run on your podcast. I just listened to your description of it on Episode 10, and it sounds unappealing. You stressed the mechanic of fatigue, which sounds like it really slows the game. You emphasized the game “arc,” wherein you “start off fast . 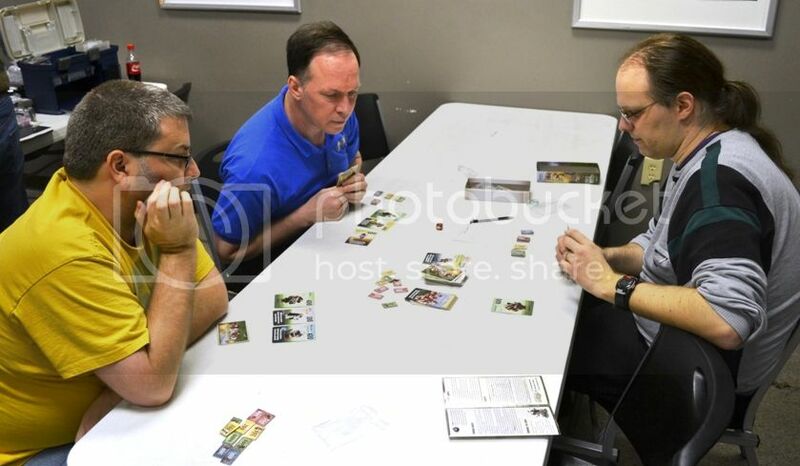 . . having lots of success and then it gets harder and harder as you go because you get so tired.” This seems like exactly the opposite of what I want in a game, especially a deck builder. I want my progress to make me more and more powerful and agile. Your description sounds like the game becomes more and more of a slog, as if the “deck building” is the accumulation of fatigue cards that impede you. Yuck. Please discuss this again! 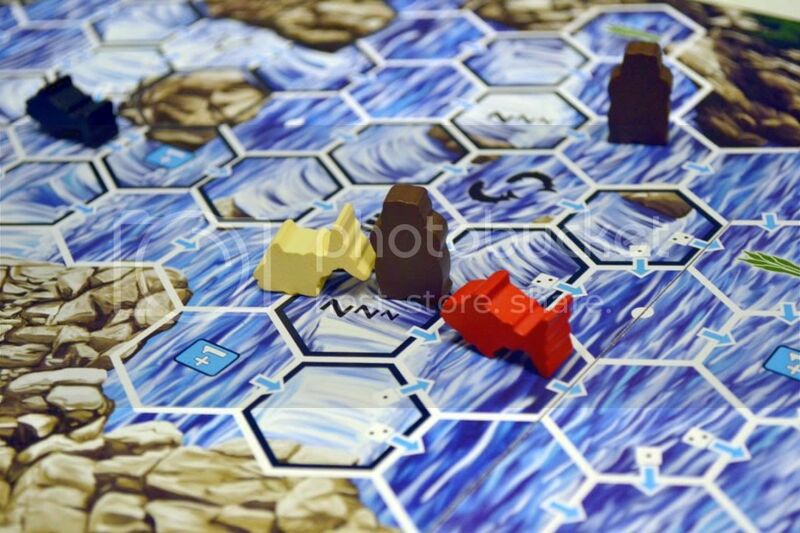 Okay, let me start by saying this again – Salmon Run is NOT a deckbuilding game. 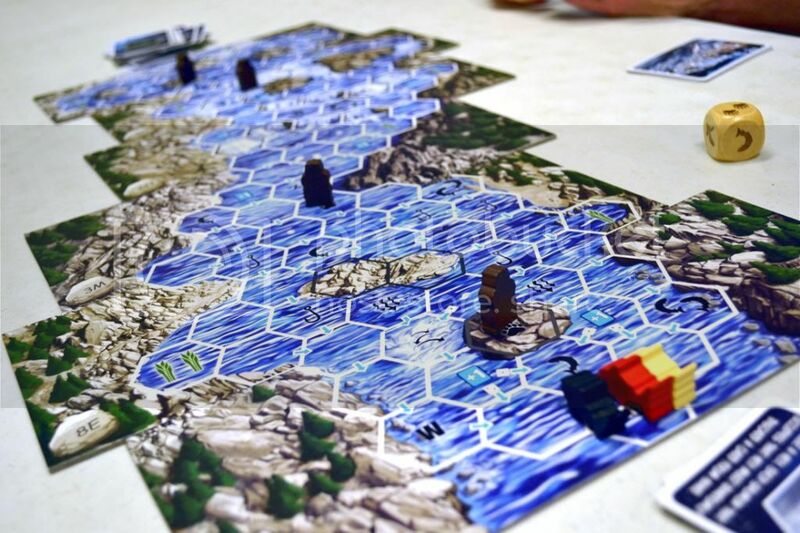 So even though I’m about to make a comparison to a deckbuilding game, Salmon Run is primarily a really cool and thematic RACE game that happens to use a deckbuilding mechanic. And as a race game, I think it is really cool and interesting, probably more so than almost any other race game that I’ve played before. But you know, if you like deckbuilding games, especially the deckbuilding game (Dominion), then you’re used to a very similar mechanic. Because the way that the victory point cards build up in your deck in Dominion is very similar to the fatigue mechanic in Salmon Run. In both games, you’re accumulating cards that don’t do anything and which (during play at least) only clog up your hand. 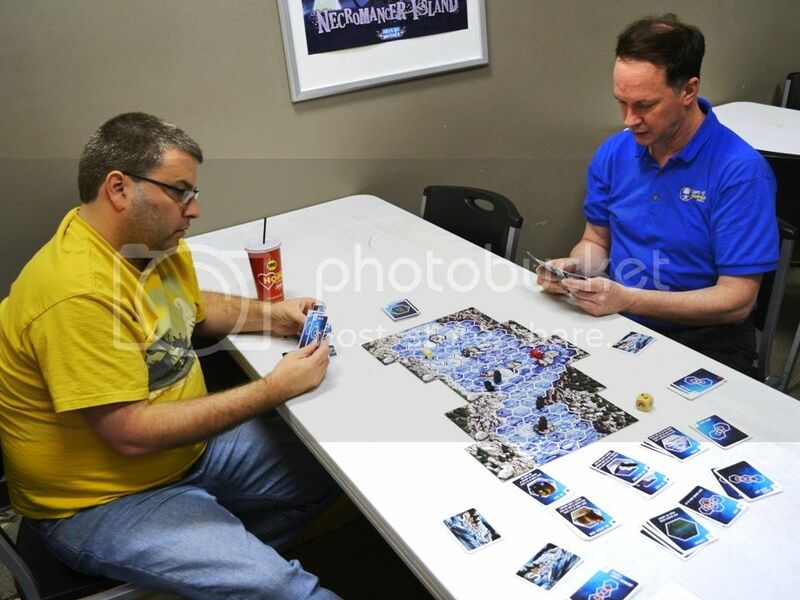 And also in both games, you have some control over when and how many you accumulate. If you always buy a victory point card in Dominion every time you can afford one, you’ll be “ahead” early on, but then get less and less effective as the game progresses. And in Salmon Run, if you push it hard from the get-to and always play 3 swim cards and be as aggressive as you can jumping over waterfalls, then you’ll build up a lot of fatigue that will slow you down later. But in both games, if you pace yourself more (working more on your “engine” early in Dominion or just playing 2 swim cards at a time in Salmon Run), then you’ll be more effective near the end. And actually, I think that there’s more strategic variety in this aspect of Salmon Run because the heavy fatigue route is probably more viable in it than is the “but VP cards early” strategy is in Dominion. Previous Post: Exploring Games, Episode 10: Unpub Mini and More Reviews!